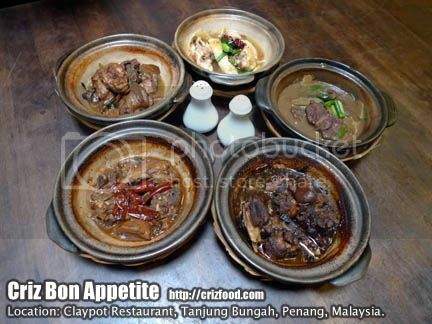 It has been quite awhile since I last visited Claypot Restaurant for some warm home cooked dishes. Even though the restaurant has switched to a different ownership for almost two years plus now, the food still managed to maintain its quality and taste. There are barely many changes in the ambience with cozy indoor dining areas and cooling al fresco areas for diners. 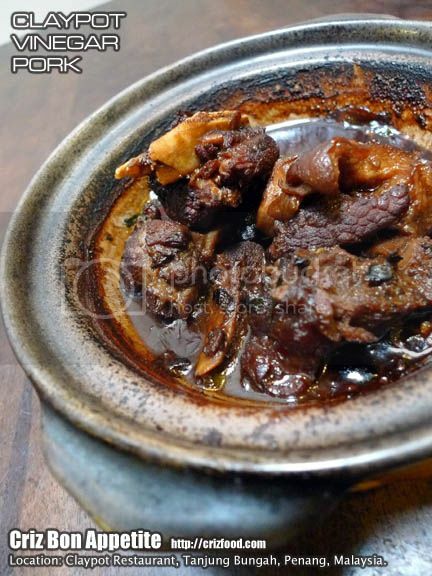 As the name has suggested, most of the dishes would be presented in claypots from dishes such as poultry, seafood, meat, vegetables, soups, eggs, tofu, rice sets, porridge to desserts. 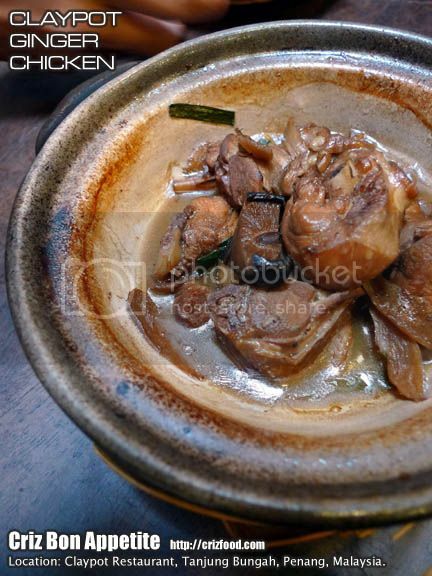 Some of the recommended meat dishes would include Claypot Salted Fish Chicken, Claypot Herbal Chicken, Claypot Ginger Chicken, Claypot Vinegar Pork and Claypot Ginger Beef. The Claypot Salted Fish Chicken (RM8) was quite nice but could be a bit spicy with the usage of lots of dried chilies for those non-spicy food takers. At least the salted fish bits they used were of a better quality which did not give that overpowering fishy taste and the gravy went well with rice. The only think I detested was the seeds from the dried chilies. They should have removed them before cooking as it would lead to appendicitis in the case of unlucky diners. 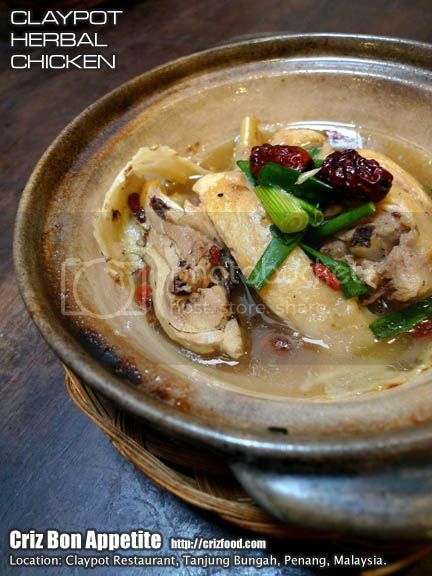 The Claypot Herbal Chicken (RM10) has a strong dong quai (當歸/Angelica sinensis/female ginseng/Chinese ginseng) flavor, with the sweetness coming from some red dates and Chinese wolfberries (枸杞/Goji berries/kay chee). Dong Quai is traditionally used to fight against tiredness, anemia and high blood pressure whereas Chinese wolfberries have high nutrient value and antioxidant contents. Together cooked with chicken, this dish would be highly recommended for those with a busy lifestyle. 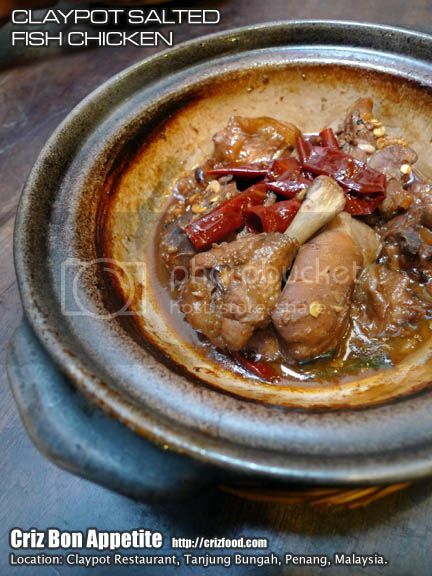 The Claypot Ginger Chicken (RM8) has that nice ginger flavor with a hint of some sesame oil. Nicely braised together with some slices of Chinese mushrooms, this dish would be ideal for all ages. The gravy itself was very appetizing and would go very well with hot steaming rice. The Claypot Vinegar Pork (RM8) has that slightly sweet taste from the black vinegar used with mild taste from some ginger slices. The pork trotter cuts used were tender enough but contained a lot of fat and bones, which might not be suitable for those health conscious diners although there were still a substantial amount of meaty parts given. Though flavorful, it lacked the strong taste from old ginger, especially those grown within the Air Itam region. 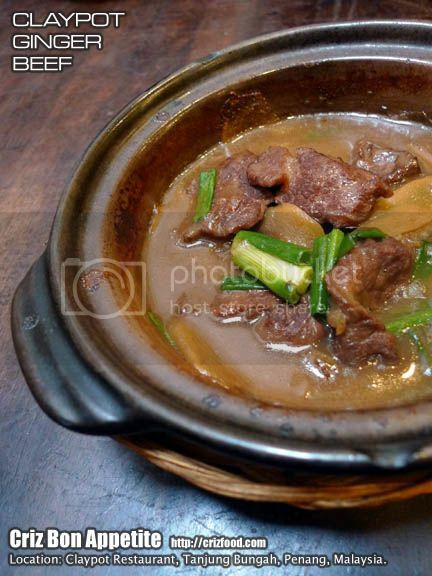 The Claypot Ginger Beef (RM9) was a lovely dish with tender beef slices slowly braised with ginger and garnished with spring onion stalks. The beef slices have obviously been marinated with ginger juice as tenderizer to get that tenderness. This would be a nice dish to go with rice. 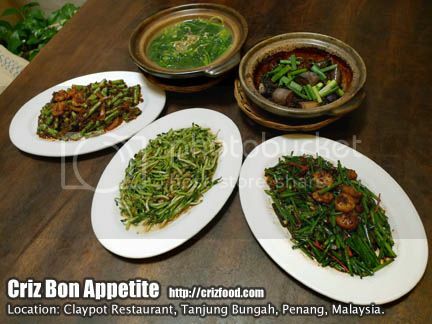 On the other hand, some of the recommended vegetable/soup dishes would include Claypot Brinjal with Minced Pork, Claypot Spinach Soup with Century Eggs, Stir Fried Chinese Chives Flowers with Shredded Meat, Stir Fried Long Beans with Prawns and Sambal and Stir Fried Dou Miao. 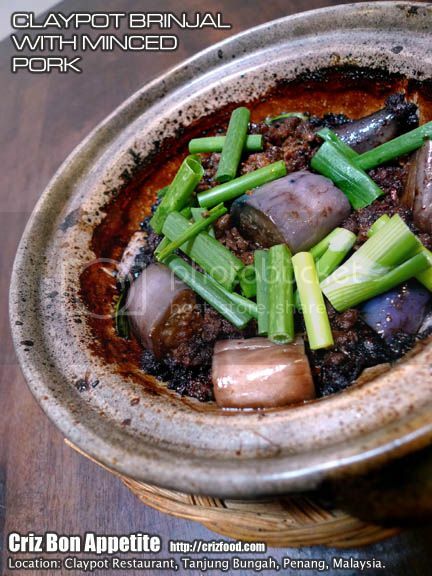 The Claypot Brinjal with Minced Pork (RM8) has just the right flavors from the sautéed minced meat. The brinjal (eggplant) cuts maintained its juiciness and were not overcooked. 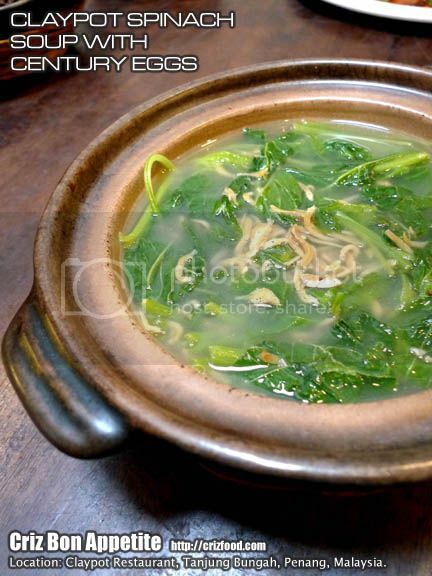 The Claypot Spinach Soup with Century Eggs (RM8) has that nice flavor from the baby anchovies stock but somehow I could not find any traces of century eggs being used here. Either they have been eaten up before the dishes came to me or the kitchen has forgotten to add them in before presenting to us. 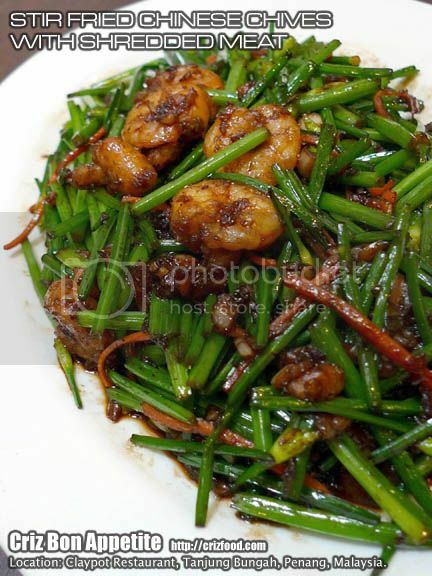 The Stir Fried Chinese Chives Flowers with Shredded Meat (RM11) was another confusing dish for me as there were prawns everywhere minus the traces of shredded meat. The taste was right with the fragrance coming from the sautéed chopped garlic but the vegetables were a bit too fibrous for my consumption. They should have chosen less mature ones with more flowers for this dish. 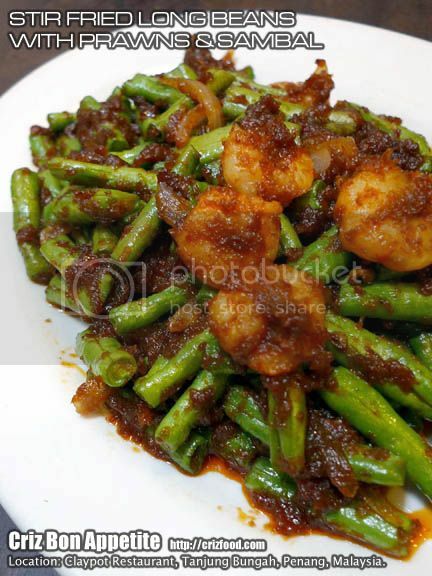 The Stir Fried Long Beans with Prawns and Sambal (RM10) was the group’s favorite as the long beans had the right bites with the flavorful sambal and fresh prawns. Ideally, there’s another dish with the same value and taste that got me yearning for more. 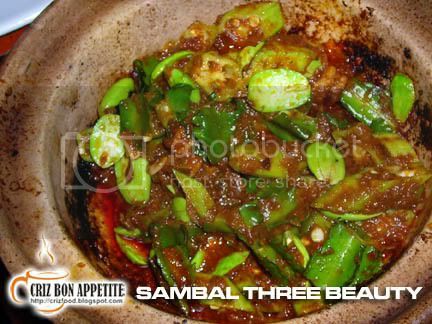 If you are a lover for buah petai (stink beans), kacang botol (goa beans) and lady’s finger, you should also try out their Three Beautiful Ladies (三大美人). 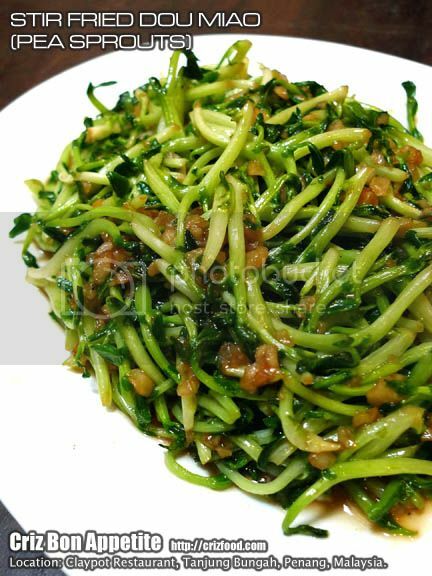 The Stir Fried Dou Miao (RM8) or also known as pea sprouts was a normal dish stir fried with chopped garlic. It can be rather fibrous for many if consumed jut by itself. Normally, I would combine them 50:50 with bean sprouts to make the dish more palatable for all. It did not strike my mind to ask the chef if they would allow such a combination. They would be no harm asking too since both dishes are priced the same. 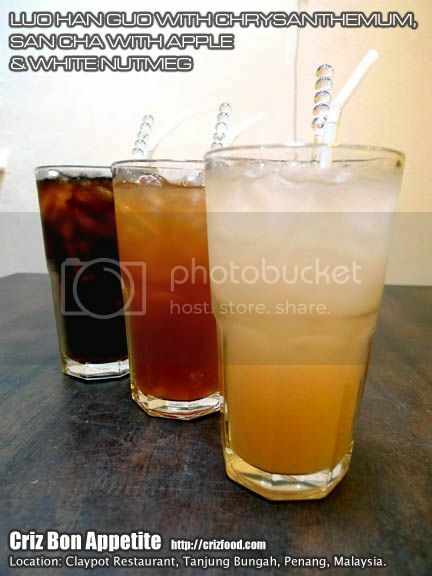 There are a few herbal drinks that you can order here such as the Luo Han Guo with Chrysanthemum (RM2.50), San Cha with Apple (RM2.50) and White Nutmeg Juice (RM2.50) from their beverages menu. Luo Han Guo (Siraitia grosvenorii/Buddha fruit/longevity fruit) acts as a natural sweetener and together with Chrysanthemum, are traditionally used to treat sore throat, chronic cough, heat stroke and to enhance immunity. San Cha (Crataegus pinnatifida/Hawthorn Berries) together with green apples is primarily used as a digestive aid in flushing out unnecessary fat after a hearty meal, relieve constipation, lowering blood pressure and more. It’s a great drink but DO NOT OVER CONSUME the beverage, constantly or with an empty stomach as it also acts as a sleep sedative when overused. PREGNANT LADIES are discouraged from drinking this drink. I have my recipe here if you would like to brew your own. White Nutmeg Juice is actually blended fresh nutmegs with sugar added compared to those reddish ones which has been brewed for hours with sugar. Nutmeg has strong antibacterial properties which would effectively kill a number of cavity-causing bacteria in the mouth as well as to treat excessive stomach or intestinal gas, aid digestion and improve appetite. It’s also used in Traditional Chinese Medicine (TCM) to treat impotence and liver disease. 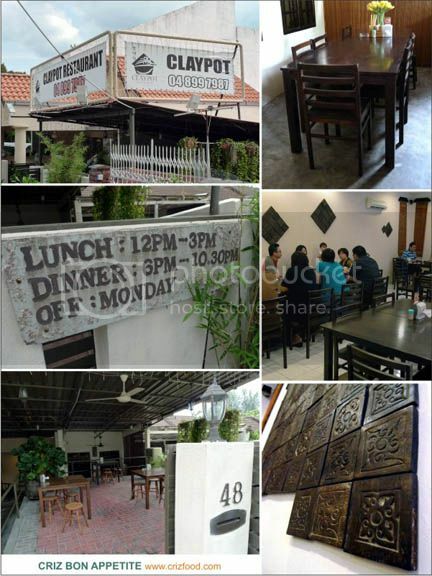 It’s quite easy to locate the restaurant as it’s situated nearby the Mutiara Selera Food Court at the base of Pearl Hill, Tanjung Bungah, Penang. 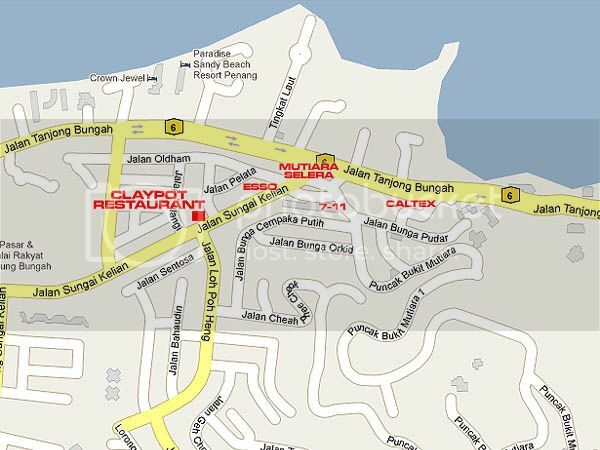 To go to this restaurant, just drive towards Batu Ferringhi. When you reach the Penang Swimming Club on your right, drive ahead until you see Caltex petrol kiosk on your left. Just a few meters away, you would reach a traffic light (Mutiara Selera Food Court just in front). Turn left into the road and at the first Y junction, turn right. At the second Y junction, turn left. That’s Jalan Sungai Kelian. Drive ahead and you will see the restaurant on your right opposite Jalan Loh Poh Heng.